I have a confession. 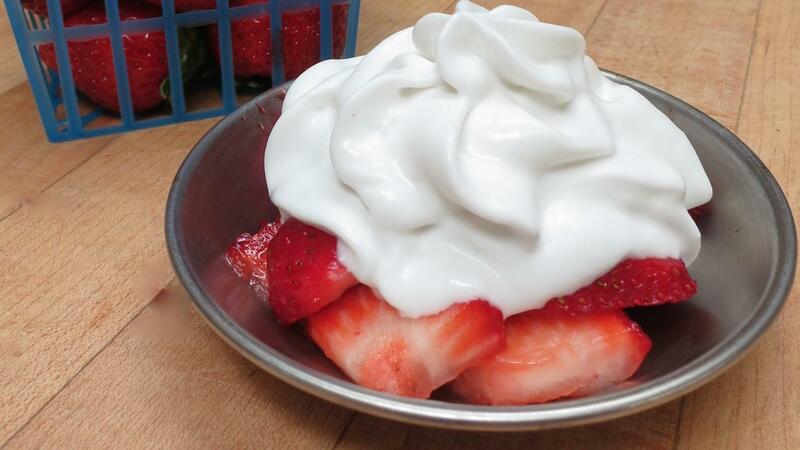 For over a decade, I’ve had a big secret about whipped cream that I’ve kept all to myself. As I’ve watched my chef friends toil over making vegan whipped cream with countless cans of coconut milk and loud stand mixers whirring away, I’ve been kicking back and enjoying my efficient and reliable method. It’s just not right to continue keeping this secret, so I'm ready to divulge. The only problem is that my trick relies on something I am typically against—a single-use kitchen gadget. [gasp!] Why do I avoid them? I like space and organization so everything in my kitchen must earn its keep by doing at least double or triple duty, meaning there is little room for a single-use tool. Alas, this one doesn’t qualify—it’s only good for one thing, but hey, that one thing is making homemade vegan whipped cream in a flash! There are times when exceptions must be made. If you're not on board yet, you'll understand just as soon as you watch my video below, make some vegan ice cream or a smoothie; get a piece o’ pie; or make a mug of vegan hot chocolate, chai, or cafe au lait, and top it with your very own light and luscious coconut milk whipped cream. It’s so quick and easy that our daughter has been keeping us stocked since she was 7. Yes, it's really that simple! And so delicious that many people like it even better than dairy whipped cream. Ooo-la-la! 1. Chill coconut milk for 4-6 hours, or overnight. In a medium bowl, whisk together all ingredients. 2. Pour into cream whipper, fill with nitrous oxide charger, shake, point nozzle down, and squeeze the trigger slowly to use. Keeps in the refrigerator for 5 days. Create your own flavor by adding any of the following ingredients: cocoa powder, espresso, spices like cinnamon and nutmeg, cayenne, or anything else you can dream up!